Tomorrow is Visit Your Local Quilt Shop Day. As part of the day bloggers have been encouraged to join in a blog tour and write about their favourite independently owned local store. 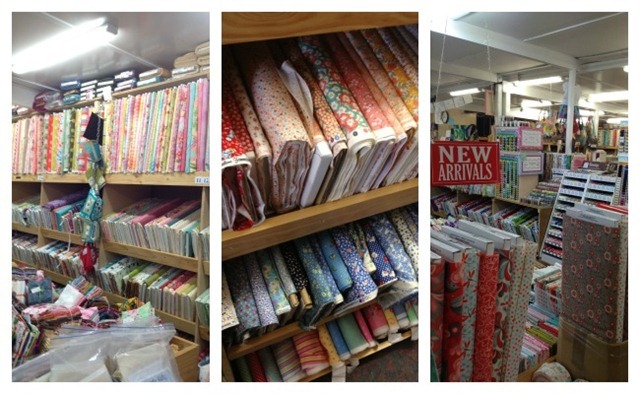 Did you know within five minutes of my home is a quilt shop that currently has over 12,000 fabric bolts in stock? I didn’t. In fact while I’d seen the Patchwork with Gail B sign many, many times I never stopped and had a look as I assumed the store would be small and perhaps a bit old fashioned. Silly me. About a year ago I finally did stop. I’d been to the large chain fabric store down the road and was frustrated with their never changing range. On a whim I stopped at Gail’s. I walked through Keith Fagg Tile Shop to the back, opened the door and my jaw dropped. Tears of joy sprung to my eyes as I held beheld the largest collection of fabric I’d ever seen. And not just any fabric; bolts of my favourite designer lines were right there, fabrics I’d usually buy direct from America as they’re hard to find locally were right there. Five minutes from my house. I felt silly and promptly raved about the store to all my sewing buddies. As you can see there are lots and lots of pre-cut fat quarters. Hundreds in fact.. possibly thousands arranged in a wonderful bench that takes up the middle of the store. It’s easy to spend an hour just looking at those. If you only see the fabric you want on a bolt they are more than happy to cut you a fat quarter. 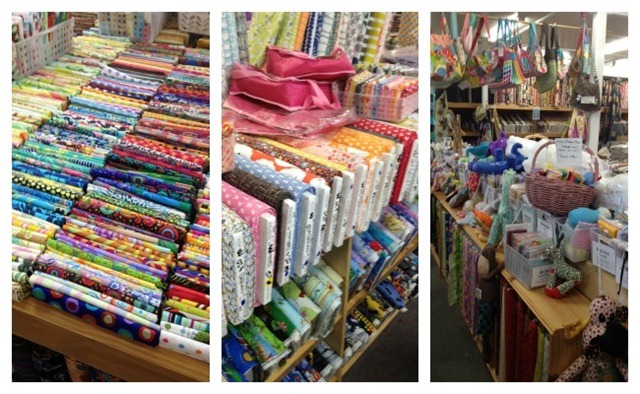 As well as fat quarters you can also pick up small off cuts, charm squares, layer cakes, and jelly rolls. The bolts of fabric are arranged around the shop grouped by collection, colour or style. It makes it really easy to find what you are after. Being a quilting shop the vast majority of fabrics are quilting cottons, but they also sell minky dot and printed flannelettes. A big highlight for me the first time I went was discovering bolts and bolts of 1930’s repro. You can see a small selection of these in the bottom middle photo. Patterns! I often see patterns such as Melly and Me online but have trouble gauging what the finished piece would actually look like in terms of size. Gail stocks a huge amount of Melly and Me, Ric Rac, and Rosalie Quinlan just to name and few and in most cases there’s a finished example there. They also sell fabric kits for quite a lot of the patterns. There’s also a nice range of notions, trims, bias binding, quilting panels, quilting templates, stitchery patters, books, and felt. The felt is lovely. So there it is, my favourite quilt shop. If you live anywhere in the Easter suburbs of Melbourne I say a visit is well and truly worth it! I can’t imagine many people would walk out with nothing at all. 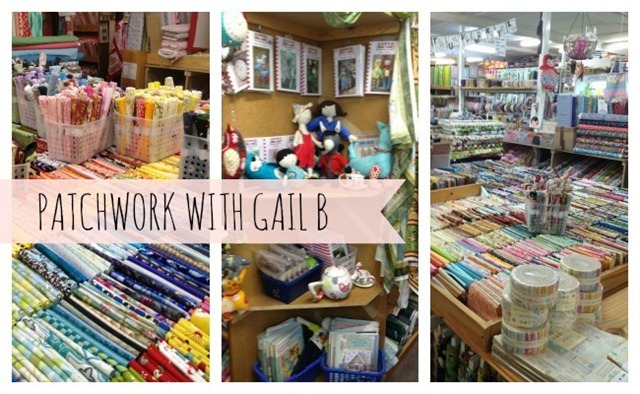 Patchwork With Gail B is located inside the Keith Fagg Tile Shop at 202 Canterbury Road Bayswater. Diagonally opposite Bunnings.